10 Contoh Pembuka dan Penutup Pidato Dalam Bahasa Inggris Yang Baik Dan Benar – Sahabat SBI dirumah sedang mencari referensi Contoh Pembuka atau Penutup Pidato Dalam Bahasa Inggris. Kebetulan sekali dibawah ini admin memberikan 7 contoh Pembuka dan Penutup Pidato Dalam Bahasa Inggris. Selamat Membaca dan Semoga bermanfaat! The honourable Mr. Headmaster of SMP N 1 Metro and all of Teachers SMP N 1 Metro, and all of my beloved friends. First of all let us pray praise the presence of Almighty God for His blessings we can gather on this day in this event…………………..
On this happy day allow me as…….. To deliver a word or two words to……..
Dear Principals SMAN 1 Kalirejo, all of the teachers SMAN 1 Kalirejo and all of beloved friends from first grade to third grade. First of all I would like to ask all of you to give thanks to the presence of Greatest ALLAH SWT, who has given us the blessing and guidance, so that we can gather here in this beautiful place. And I also I ask you to deliver your prayer and greetings to our prophet Nabi Muhammad SAW, who has brought us which has brought us from dark-age to the age-lit, so we are always on the right path until the end of the world. The honourable Mr. Chairman of the Committee and all of audience who has come in this event for accepting the invitation,. In this happy day let us Praise the presence of Allah, who has given His grace and guidance to us. Because of His grace we can gather on this day in the event…. Perhaps enough so that I can say as ….., no more or less as well as mistakes that I said either intentionally or not, I really apologize. Thanks for attention and Good bye. 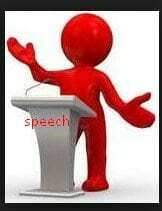 That is all speech that I can deliver. Ideally what I have said is gainful for us. I am so sorry if I had a mistake. Thank you for your nice attention. Presumably enough up here a little speech that I can say. For all the mistakes and said words are less willing hearts in your heart, both of which I intentionally or not, I apologize profusely. Itulah tadi 10 Contoh Pembuka dan Penutup Pidato Dalam Bahasa Inggris Yang Baik Dan Benar. Semoga bermanfaat buat Sahabat SBI yang sedang ingin membuat naskah pidato dalam Bahasa Inggris. Ikuti terus www.sekolahabahasainggris.com. untuk mendapatkan referensi belajar online Bahasa Inggris. Terima kasih.